Hello and welcome to a brand new year full of excitement and new things. Firstly I would like to welcome all of our new families to our centre and look forward to working with you closer. I would also like to welcome back all of our families and hope you all had a wonderful Christmas and New Year break. I though I would introduce myself again and tell you a little about myself for all that are new to the service. My name is Kylie and I am the Centre Manager here at Piptree Tanah Merah. I have been here since the beginning when we opened 2007. I have grown within the centre starting as an educator up to Centre Manager. I also have a son who attend Piptree and is heading off to prep next year. As we have a lot of vacancies throughout the centre due to our lovely schoolies moving on to primary school. I would like to put to you that if you would like extra days or know of anyone who is looking for care to recommend our centre.In return, you can receive up to 2 week's free childcare when the new enrolment mentions your name.Please see me for any further information as conditions apply. We have recently gone through Assessment and Rating awaiting our results. They should be in with in two weeks. .Our team of professional Educators are always working hard to ensure we are all well and truly on track to meet all Quality Areas and this year we will be all about consolidating and continuing to improve in all areas. Sunscreen please remember to donate a bottle of sunscreen to the service or if you would prefer to donate $6 I can buy one for you. Please be reminded to update you contact details and immunisations records so we are ready for 2019. This way we are off to a running start. We have been finding that many parents are not signing their children in on arrival and out on departure each day. It is a legal requirement that you sign your child in and out every day of attendance. In case of an emergency, Kiosk is used to check all children present.In case the system is down we have a folder with spare sign in sheets for you to use.Once the system is up and running again I will enter in the times of your arrival and you will be asked to confirm the next time you sign in. .A staff member is more than happy to assist you if you are having difficulty. We can't emphasise enough the importance of labelling your children's belongings. There is a company called 'Label by Design', where you can order labels with your child's name on them specific to your needs.Otherwise we have marker pens located in each of the rooms for your convenience to label. A Calendar of Events will be sent home soon, outlining all the upcoming events for 2019. Please keep an eye out for this, so you can pop it on your fridge and know exactly what is happening at the centre. We also have a copy for you in the foyer. Please remember to name all items. We are still having problems identifying each child's belongings and it is not fair to expect the children to know which is theirs when there are so many of the same type of article e.g. drink bottles etc. When taking holidays it is a requirement as per your enrolment agreement to give two weeks notice to request reduced rate holiday fees. Forms for Enrolment alterations are available at the front desk. Your parent pockets are located in your child's room. Please remember to empty them daily. Important information regarding the centre is contained therein. Please remember to ensure your child/ren have a hat they all have piptree hats so please fell free to use our hat buckets outside each room and water as the days are getting longer and hotter. The children also require shoes as the ground can get quite hot. Havane -With a passion for early childhood education and a super human connection to children, I feel as though the short 3 years I have been in the early childhood education industry feels more like 30. With my diploma of early childhood, an updated blue card, current first aid certification, asthma and anaphylaxis training, this year I will be accompanying my children from sprouts to their new room buds. During this time I hope to continue to help children to become the best version of themselves as they will help me become the best version of mine. Kerrie - I am looking forward to the new challenges the nursery will bring and the year as a whole.I hope it will be fun and fantastic year and look forward to building strong bonds with you and your child. I am also the 2Ic here at the service and i have my Diploma. Teagan - This year we will be practising and learning our pre-writing skills, letter and number tracing. I am looking forward for a great year with the Blossom children and their parents and will strive to have a fantastic room. Elle - I have been working in the industry for 2007 and here at Piptree for 7 years. I am diploma qualified and I love the journey you have with children. I became a mother in 2016 and he also attend Piptree. I look forward to meeting you all and creating a blossoming relationship with you and your family. Brie - I am the Early Childhood Teacher and I am very excited that 2019 is here and looking forward to working with the children and yourselves throughout the year. My Name is Kamani and I am the After school Care Group Leader. This is my third year working as the After school Care Group Leader. I have been working at the centre for 10 years as a Group Leader with different age groups over the years. I am looking forward to working with your children this year. Lucy - HI! 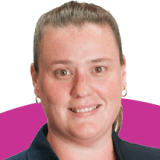 My name is 'Lucy Stevens", I've been working at this childcare centre (Pip Tree) for 10 years.I enjoy being with the children and learning about each child's needs in different age group. I am going on extended leave until April and then returning as the Lead Educator Float. Look forward to a great year ahead.